We thought it could be useful to share our thoughts on what to expect and how to prepare for SaaStr Annual 2016, for those who weren’t at the inaugural event last year. What is SaaStr Annual 2016? It will be the biggest gathering of senior SaaS professionals in history! Well…maybe…Dreamforce is bigger but it’s also more diluted, SaaStr is purer SaaS. You can read my notes from attending last year’s SaaStr Annual – the quick version is that the event was so good we decided to sponsor this year and fly five of the team out from Berlin. Make sure to download the event app, you can connect with other attendees and view the agenda. Plan which talks you want to see – the speaker lineup is fantastic and there will be many great talks – but you can’t see everything (there are two tracks). You can bookmark talks in the event app. Bring a notepad, there’s so much knowledge and tips being shared, I ended up with pages of valuable notes last year…and this time it’s three days instead of one! Bring a LOT of business cards – you’ll be meeting with founders, investors, existing customers, potential customers, potential partners, come prepared. If you’re flying in from overseas it’s a good idea to arrive a couple of days early to adjust to the time difference (we will be flying in from Berlin on the 6th of Feb so we’ll have a couple full days to adjust to the 9 hour time difference). There’s no point to fly in and then be yawning throughout the event. Make sure you remember to charge your phone overnight, being at an event all day with a dead iPhone is just frustrating. Last year the event wasn’t small, but it wasn’t a ‘huge’ event, this year I’m guessing it’s going to be around three times bigger – so it will feel big. Last year the event was basically split into two parts: upstairs there were talks going on and downstairs there was the booths, networking and food area. The venue map hasn’t been released for this year yet, but by the looks of things there will be tonnes more sponsor booths, one megastage and one smaller stage. It’s mostly senior (and very senior) SaaS execs attending (decision makers) – so deals get done, partnerships are made knowledge is shared – we met and eventually closed two of our largest customers to date at the conference last year. The networking is second to none if you’re in SaaS. The official party is on the Wednesday evening. There’s also some unofficial/invite-only parties and meetups going on during the week. ChartMogul will be hosting customer meetup on the Friday evening (12th Feb) – invites didn’t go out yet. 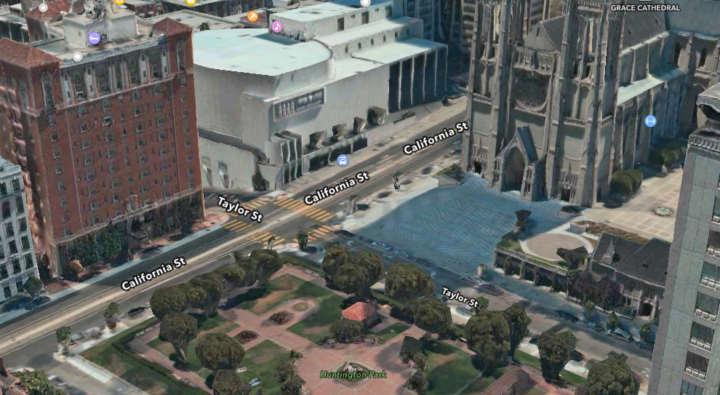 If three days of non-stop SaaS awesomeness wears you out and you need a breath of air, I recommend taking a stroll through Huntington Park which is just across the road from the Masonic Center and next to the beautiful Grace Cathedral.